There is a good chance that your website will be the first "touch point" between your business and a prospective customer. The design of a website must reflect your business products and services with the right flare to draw in viewers to hang around, browse, and take action (subscribe, order, request information, submit a question). Navigating around your site should be effortless and intuitive, or a viewer will leave after a few clicks. BTG Solutions will provide you with design options to meet these criteria AND lay the foundation for a five-star website. With the design criteria met, BTG will help you decide what type of content you will present. Aside from providing who, what and where you are, add snippets of interesting material that are fresh and pertinent to your viewership. ​This could include Calendar of Events, News Flash, Polls and Surveys, Media Gallery, Forums, etc. These jewels of information will keep your site fresh and relevant. 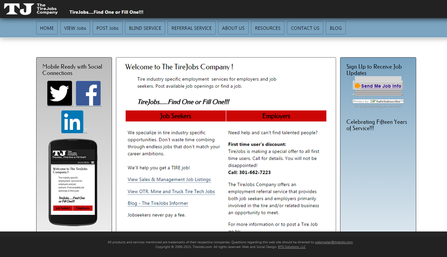 Our client Tirejobs.com can say "yes". In April of 2015 Google began to tag mobile friendly websites when providing search results on a mobile phone or tablet. ​This move was to help the viewer select sites that are responsive (designed for mobile and tablet users as well as desktop users) and persuade website designers to provide user-friendly sites regardless of the device. Social is "in" but the concept seems elusive to many business owners. Let's have some conversation about social media and discuss what might be the best way for your company or organization to be "in" it. BTG Solutions provides preliminary setup including optimized profile image creation, setting of privacy controls, establishing vanity urls and preferred method of notification when there is engagement from your audience. Hand the reins over to BTG Solutions. We will formulate a plan to get your online presence headed in a new and positive direction.